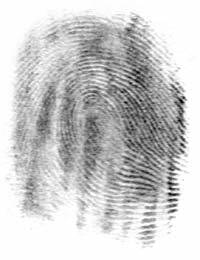 A fingerprint is a trace of a human finger left on a surface. Human fingers have small structures on them (like mountains and valleys). These structures are unique in every human; they can be used as means of identification. There are many different ways to take fingerprints. Forensic scientists use these techniques to identify a person. Electronic fingerprint scanners became widespread in the early 21st century. This page was last changed on 3 June 2018, at 00:52.